I had one of those rare and dreamy child-free days this week, and instead of spending it watching The Walking Dead in my mismatching pyjamas and staring wistfully into the fridge before deciding just to eat biscuits in bed all day, I actually got my arse into gear and went on a mate date. 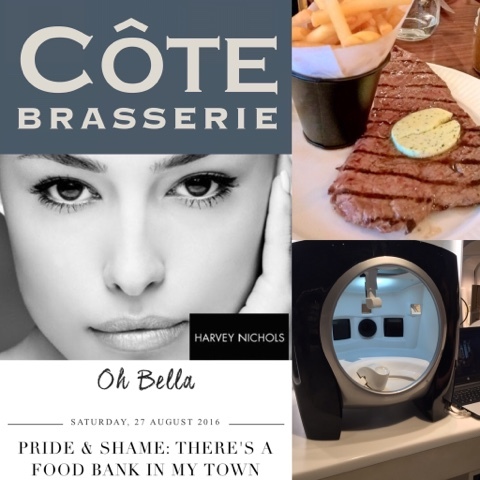 We headed for lunch at Côte and then on to Harvey Nicks for a facial. It was through “cosmetology” brand Environ and involved sticking my face into a machine that looked a bit like the eye scanner at an Opticians, but which took images of my skin to show up dehydration, sun damage, fine lines and wrinkles, and bacteria (gross). Then you get the facial itself which was kinda just OK (but only OK), and reminded me I need to invest more time and money in my body instead of just gradually turning into Tom Hanks from Castaway. There was a soft sell after the facial with Vitamin A capsules and several creams and serums available but I wasn’t in the market for spending the equivalent of a weekly big shop on under eye cream so made my excuses. Anyway it was still fun and also – according to my Life Balance matrix – energising (getting out and seeing my friend) and pampering (the facial itself). It’s made me realise I need to take stock of these things again and make sure I’m really getting a good balance. Another thing that’s been nagging its way to the forefront of my mind recently is that ages ago I said I was going to strive to be a better person and my actual efforts to make this a reality have been few and far between. So I finally got round to writing about the Trussell Trust after reading that many families really struggle during the summer holidays especially if they are eligible for free school meals during term time. It’s so obvious thinking about it now, but it had never occurred to me; I think I tend to think of Christmas and winter as being the most difficult times. As with so many things – family, friendships, career, helping others – it’s about making the effort all year round. In the words of my school reports: could do better. But lunch and a facial are a good start on the friendship front, because it’s so easy to lose touch with people and so nice when you do get to catch up.